Australian laurel (Pittosporum tobira): growing, planting, caring. A beautiful leathery foliage and fragrant white flowers. Pittosporum tobira - the Australian laurel - is a species of flowering plant in the pittosporum family Pittosporaceae native to Japan, China, and Korea and idely used throughout the world as an ornamental plant in landscaping and as cut foliage. It is an evergreen shrub growing to 10 m (33 ft) tall, with oval leathery 10 cm (4 in) long leaves and is a clusters of fragrant flowers. The Australian laurel is drought-tolerant and fairly hardy, sometimes used for hedges, or planter subjects. Many cultivars have been developed, including dwarf forms and the popular ‘Variegata’. Pittosporum are evergreen trees or shrubs from Asia, Australia, Africa or the Pacific Islands depending on the species. The leaves are simple and whole, alternate or whorled. They bear solitary flowers with 5 petals arranged at the axils of the leaves, or flowers grouped in corymbs, panicles or umbels. The fruits are spherical. Plant your pittosporum rather in autumn, in the sun or in partial shade, in light, rich, fresh soil. The ground must be well drained, and keep in mind that if it is less than 0 ° C in your area in winter, you will have to keep it in. In this case, prefer growing in a big pot. Before planting, trim damaged roots, balance the root volume and the above ground volume. Plant in a hole that is at least two times bigger than the root ball, generously spraying the roots with water before planting: this will greatly improve the chances of the plant taking root, no matter the conditions. While digging the hole, separate the layers of dirt in two piles that you will put back in order. Replace the earth starting with the bottom soil, place the tree and pay attention not to bury the root collar, which is just between the roots and the trunk. Fill the hole in and form a basin around the base, which will be used for watering the first months by tamping down the soil around the roots. Don't hesitate to use all of your body weight! Water until the planting basin is full — at least two watering cans! To help him spend the winter, protect your pittosporum from the cold winds - which are its real enemy! - bringing to his base a good mulch of leaves. In this way, even in the event of heavy frosts, new branches will start from the foot. To help it over winter, bring your pittosporum to a cold greenhouse for shelter - or a bright, but frost-free place. You can take out your pittosporum in pot after the last freezes, finding it a place in partial shade or in the sun. It will resume watering! If you keep your pittosporum in pot, plan a potting every 2 to 3 years, in a simple potting soil and a slightly larger pot. Unroll the root hair if you can, this will help your pittosporum settle into its new container. 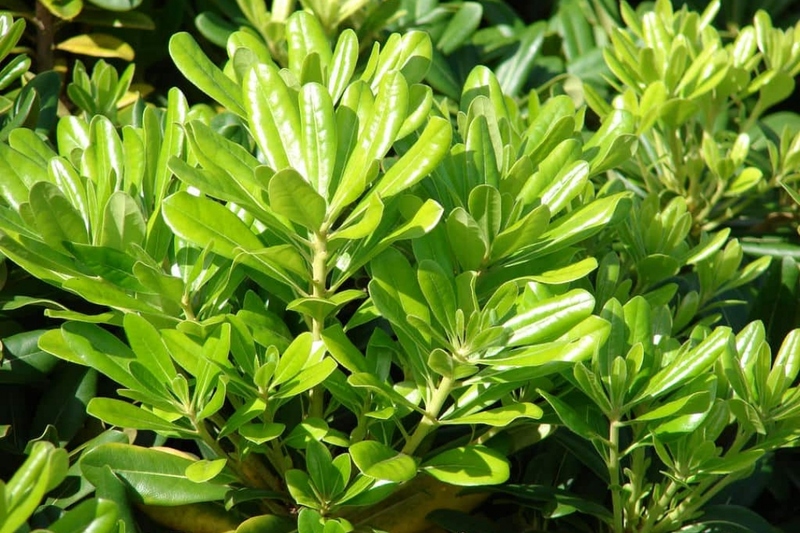 Your pittosporum will be pruned once a year, in July, to remove entangled or dead branches. You can also prune in early spring, but you may not get flowers. In pots, cut the same way but shorter to limit the volume even more. Mulch your pittosporum if you can, in the fall or spring, with shredded wood - no coniferous, if possible. Otherwise, use dryed leaves.